My family filmed a local living nativity for Christmastime this year. It was called “Journey to Bethlehem,” and it included a road with scenes along the sides. “We need a place to stay tonight,” said our guide to a Roman soldier who guarded the gate of Bethlehem. The soldier didn’t care and was gruff with us. We were told to move quickly. The town of Bethlehem had an open marketplace where a variety of foods, pottery, cloth, and animals were sold. 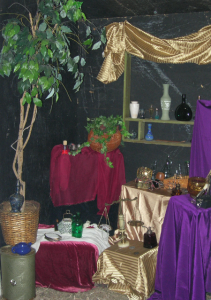 The sets were beautiful, and the ambient noise was realistic. Apparently we represented a group of Jews, because the Roman soldiers called us dogs. They told us why the Roman empire was so great, protecting people with their armies and building roads. A shepherd yelled, “Let us go and find this child!” We followed him to a stable where we found Mary, Joseph, and baby Jesus. When I reached this point in the tour, for some reason I felt choked up, almost as if I was a shepherd on that first Christmas night long ago, finding the King of Kings had been born in a manger. Here is a mime act for kids that is super fun for entertaining audiences. My son was only 7 years old when he performed it! He taught himself how to do each act. Trapped in a Box: Pat the air around you on four sides, as if you were in a box. Stiffen your hand when you hit the side of the imaginary box. You can open the lid and jump out of the box. Then push the imaginary box out of the way for the next act. The Stairs: Pretend you’re walking down the stairs, squatting down lower and lower as you go. This is a fun one to do behind a sofa so the audience doesn’t see your legs. You can climb back up the stairs if you want. The Elevator: Turn your back to the audience and push the imaginary button of the elevator. After waiting, get into the elevator and turn around. Press the inside elevator button. Now go down as smoothly as you can, bending your knees and squatting down low. If you want, you can come back up the elevator. Rowing a Boat: Stand with your body facing to the side. Pretend you are rowing a boat with an oar. When the current pushes your canoe backwards, try desperately to row your boat against the strong current. Or you can row around a lake in an oval shape, rowing back and forth. Don’t forget to lose your balance and fall into the water with an imaginary splash. The Fish: Make your mouth small, like you’re puckering up for a kiss. With both arms bent at your sides, swish your fingers back and forth like the fins of a fish. Swim around the room. Old Man: Hunch over and hold onto a cane. Wobble your cane and tremble as you walk, shaking your head as well. The Rope: An imaginary rope is hanging from side to side in front of you. Grab onto it with both hands, pulling yourself across the rope little by little. The Car: Open the door of the car and get in. Sit down and shut the door. Let off the break, put your keys in the ignition, and put your hands on the steering wheel. Start driving the car. Wave to the audience as you pass by. When you’re finished with your ride, get out of the car and shut the door. The Motorcycle: Sit down on the motorcycle and hold onto the handle bars. pull the right handlebar backwards several times to start the engine. Ride your motorcycle around the room. Try to do some tricks on your motorcycle, like taking the front wheel off the ground. The Bullfighter: Grab an imaginary red cloth and wave it in front of the bull. When the bull runs toward you, lift up the cloth into the air. Then turn your back to the audience and do it again. Try it from different angles. Building a Sand Castle: Sit on the ground and start filling your bucket with sand, using an imaginary shovel. When the bucket is full, turn the bucket upside-down, and whack it on the ground. Gently lift the bucket up, and admire your beautiful sand castle. Make another one. The Slide: Climb up the ladder of the slide, reaching up for each rung of the ladder with your hands. Once at the top, slide down the slide. Slide down the spiral slide, holding onto the sides and becoming lower and lower. The Monkey Bars: Grab onto the bar with one hand, then grab onto the next bar with the other hand, and continue until you have crossed the monkey bars. Turn around and cross the monkey bars from the other direction. Jump off at the end. Sliding Down a Pole: Grab an imaginary pole. Now turn around and around, making sure to squat down lower and lower as you slide down the pole. The Carousel: Get on the carousel, and hold onto the pole. Go up and down, making sure to continue holding on to the pole. Go in circles, and wave to the audience as you pass by. 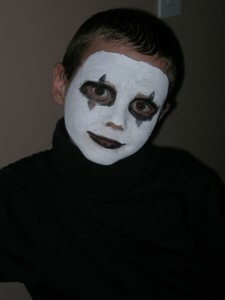 If you enjoyed this video where my son did his cute mime acts, go to YouTube and “Like” it! My son is deliriously happy every time he sees another person enjoyed his act! 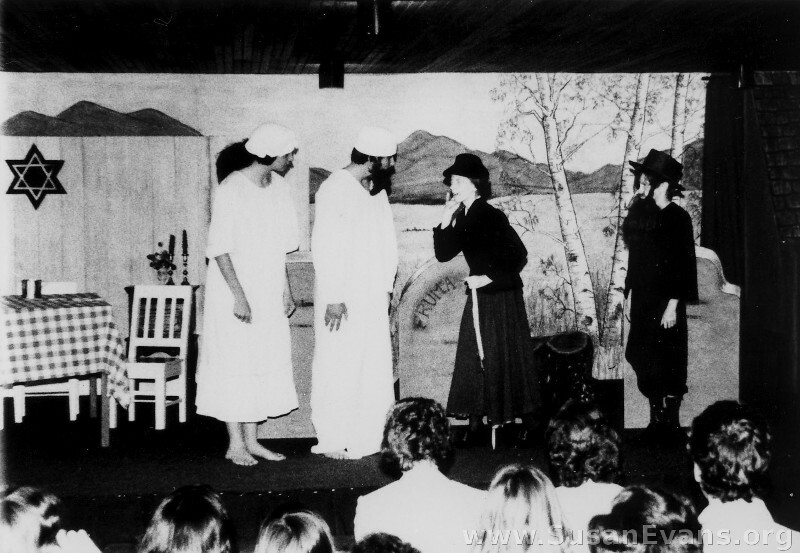 “Fiddler on the Roof” was my first taste of being involved in theater. There were no try-outs at our boarding school. We were assigned a part based on how tall we were and whether we looked like the particular character. I was assigned an insignificant role as the little old lady in the cemetery scene, but I trembled and looked toothless and spoke in my very best old lady voice. The first rehearsal left the two directors laughing hysterically on the floor, and ever after, I was given bigger parts. The make-up for the little old lady was caked quite thick, with wrinkles aging my whole face. My powdered wig made my whole head sweat. Before I went on stage, butterflies were fluttering through my stomach. I had never been on stage before. I could see lots of people in the dark audience. When the hot lights blazed on me, a surge of energy came through me, and I was able to give a good performance. The following year, the boarding school put on the play “Heidi.” I was cast as the crippled friend of Heidi, the co-star. I remember in one of the rehearsals, one of the guys had to carry me from my wheelchair to the top of the mountain. I was so thin and wispy at the time, so this was no problem for the guy. It felt odd to be carried by a boy who was only one year older than I was. But it didn’t bother me much. What surprised and shocked me was that the boy I had a crush on (more like puppy love) was secretly instructed to give me a hug at the end of the scene where I walked on wobbly legs. When he suddenly hugged me, I turned beat red. Everyone saw. Everyone knew that I liked him, and in utter mortification, I ran away. Even the teachers were laughing. They yelled for me to come back, and I screamed, “No!” from back stage. They must have dismissed the rehearsal early that day, because there was no way I would have gone back in there! Performing in “Heidi” was great fun, since I was in a lot of scenes. I was also a part of the choir which sang the songs that went with the play. The make-up wasn’t as hot, since I wore less make-up and no wig. At the end of the play, the audience applauded, and I felt a great sense of accomplishment. To keep up with my MK posts, like my MK page on Facebook.